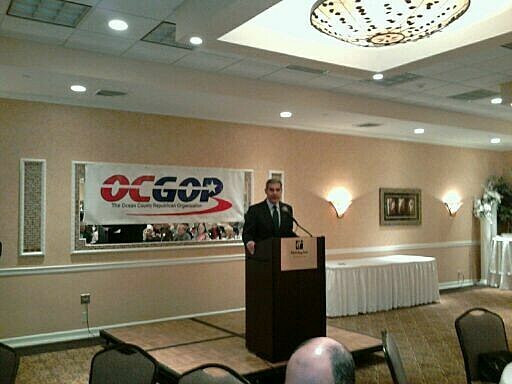 The Ocean County Republican Party officially voices its endorsement of Joe Kyrillos for United States senate and continues support of current congressional candidates in the 2012 race. Republicans from across the county gathered at the Holiday Inn in Toms River for the Ocean County GOP convention, where OC Republican chairman George Gilmore announced the screening committee is endorsing Joe Kyrillos, congressmen Frank Lobiondo, Jon Runyan, and Chris Smith , Ocean County Freeholders Gerry Little and John Bartlett, as well as Ocean County Sheriff William Polhemus. Gilmore says there were two additional challengers for the US Senate nomination and had the right to challenge the decision, however he notes both members opted to not challenge. Making it a unanimous decision. The convention also served as primer for the future plans of the GOP in the future. Gilmore says even though Ocean County has a traditionally strong republican base, the goal will be to continue pushing their message forward. Kyrillos’ speech addressed his distinction from Democratic incumbent Bob Menendez, saying that unlike Menendez he is a politician who makes himself more available to the community. Joseph Rullo was one of the challengers to Kyrillos for the US Senate seat. Rullo told his constituents not to challenge the screening committee’s nomination of Kyrillos, saying he will run as the conservative alternative in the open primary. “I decided that I didn’t want to put my friends in any kind of tension or discomfort, therefore I asked all of my friends to not nominate me, therefore they gave me the privilege and honor to be able to speak and get across that I was running in June.” Says Rullo. He notes the difference between himself and Rullo is that while he does not have the full support of the party, he also isn’t a career politician.